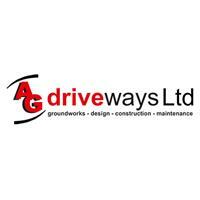 AG Driveways Ltd - Driveways/Patios/Paths, Fencing/Gates based in Allington, Kent. AG Driveways are a Maidstone based company specialising in all types of groundwork from design through to construction. We also offer an after care service to keep your drive or patio always looking its best. Professional Services for the Public and Businesses. ~ High Pressure Cleaning System. We offer a FREE no obligation quotation on all our work. We leave your property clean and tidy giving total peace of mind.